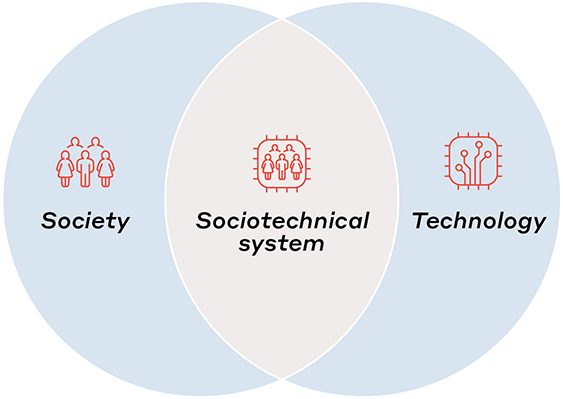 To maximize the value from new technology, it must be incorporated and accepted by society – a marriage of the social and technical, to form a socio-technical system. As in any real marriage, it can only deliver its promised benefits if there is understanding, communication and acceptance from both sides. Too often, the benefits of our engineering solutions come up short because it is almost impossible to foresee how people will interact with the technology, and especially where discrepancies will ocurr between intended and adopted use. The very people who should benefit avoid due to perceived risks, uncertainty about the benefits, or lack of awareness of the technology’s availability or use. Plus, if they saw, heard or experienced something negative related to the technology in the past, their views will be even harder to change – a phenomenon known as sticky information. To increase the likelihood of technology uptake and success, opinion leaders like futurists, technology developers, and city and national officials who see the wider benefits of the new technologies, must work together to create trust in new technology, by building in awareness, experience, ease of understanding, observability and credibility across a wide variety of potential stakeholders, which include both users and non-users of the technology. The first step in building trust is to familiarize people with the new technology – make them aware of it and provide training so they can understand how it might improve their everyday life, and how to use it effectively. Considering infrastructure and transportation systems as integrated, coordinated socio-technical systems is crucial when developing new technology, and is an essential aspect of intelligent infrastructure. 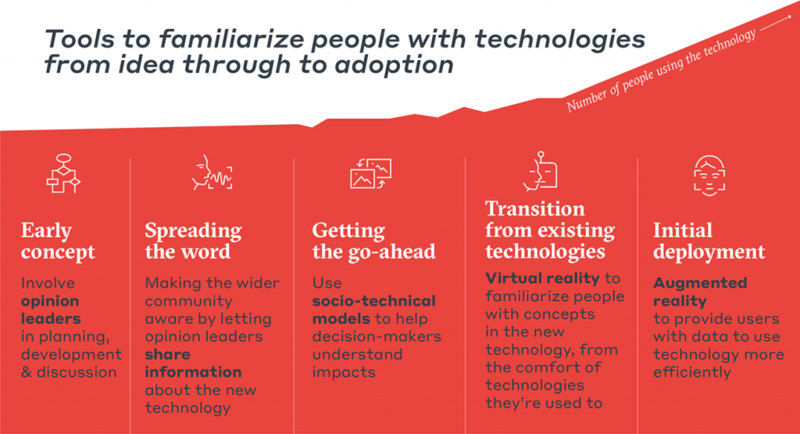 New technologies are only as effective as adoption allows; people must be prepared to use these technologies if they are to fulfill their purpose and improve our lives. Opinion leaders must co-ordinate efforts to understand the full effects that the new technology will have on users and the current infrastructure. Active communication is required with the wider community to educate them so they can develop their own informed opinion. To help understand the system-wide impact, modelling techniques that incorporate user behaviours are strongly recommended. Virtual reality is recommended for training potential users and further informing users and early adopters. Augmented reality can be used as a tool to help people use new technology more correctly.